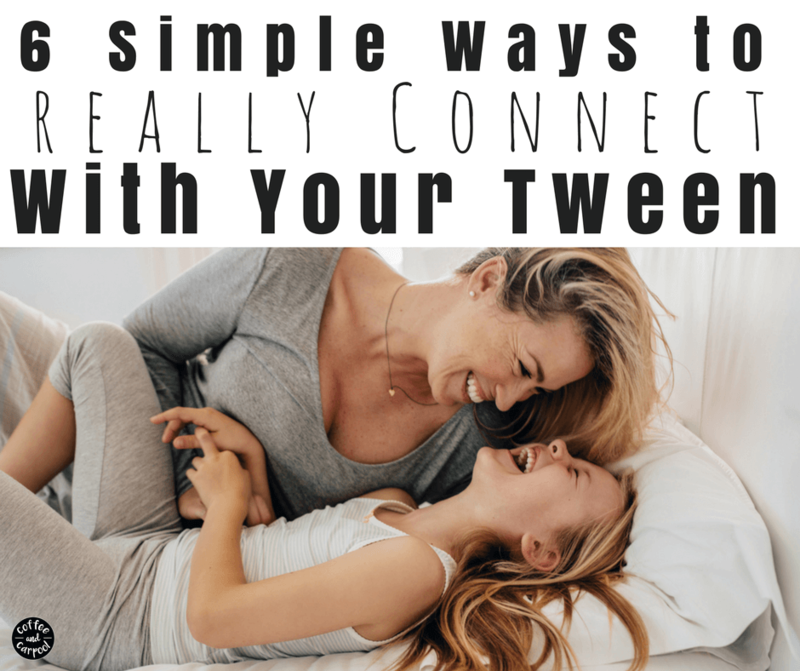 Inside: Are you looking for ways to connect with your tween or connect with your preteen? These 6 ideas will help you feel more connected and give your tween more confidence. My eldest daughter is my mirror image. It’s seriously like watching my childhood on repeat. She gets mad at the same things as 10-year-old me. She gets annoyed at her siblings for the same reasons I did. And she gives and requests love the same way I still do. But as similar as we are, it’s so easy to get pulled apart from her emotionally. She doesn’t understand why she gets so outrageously mad. And she almost can’t control the words coming out of her mouth as she screams at me. Her tween tantrums give her toddler tantrums a run for their money. When she’s in these moods, I sometimes feel like I’m losing her. But I can’t lose her. She’s my baby. My first baby. She’s the kid who made me a mama. And I only have 8 more years where she’s living in this house. Eight more years where I can help shape the relationship I want to have with her when she’s an adult. In eight more years, she doesn’t have to come back to me and my home if she doesn’t really want to. So I have to find ways to connect with her. To really connect and know her. 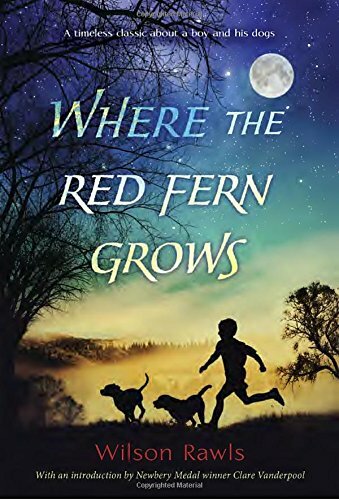 You can call the 9-12-year-old stage of life anything you like–preteen, or tween, or tweener–but she’s caught between the two worlds of childhood and adulthood. And since she’s stuck in between, I have to get to know the new her. Oh, I knew the 2-year-old version of her. I even knew the 9-year-old version of her. And I knew her at every age in between. But the 10-year-old version of her is a paradox. She believes in Santa with her whole heart, but we’ve also had the birds and bees talk and she carries an emergency menstruation kit in her backpack. She plays with dolls in her dollhouse, but she has started to get acne. And she will happily watch a Disney cartoon TV show, but she wears a bralette and deodorant. Some days she’s my sweet little girl who adores me and wants to hold my hand, and other days she’s my hormone-raging teenage daughter with a pissy attitude. It’s confusing for both of us. So I must find ways to connect with her. To connect with the new version of her. I know my child. But I need to get to know her as a young adult. And to make it even trickier, there’s not a ton of time to connect with her. On Mondays, I have ten minutes with her in the car as we race from school to karate. Tuesdays, we only have bedtime to connect. 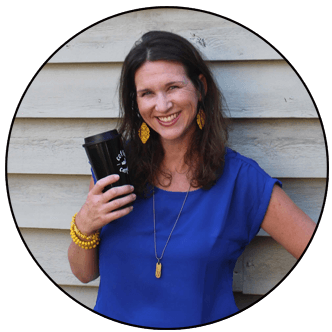 I have three kids who all vie for alone time with me, I have a business to build, and the laundry and dishes seem never-ending. And she doesn’t have a ton of time either between school work, extra-curricular activities and religious school. So anything we do has to be the best bang for our buck. We’re not shooting for long periods of time, so we tend to sneak in our connections when we have a few minutes to spare. This is something we started when she was five years old, but we continue it to this day. I bought a cute little journal and whenever she wants to, she writes to me and puts it on my pillow. I write back, by answering her questions or asking her a few and then put it on her pillow to find. 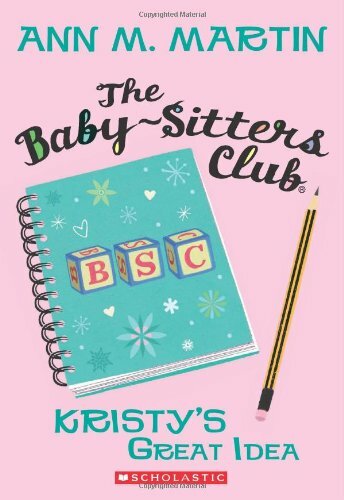 If a journal isn’t your thing, set your daughter up with a free email account and send each other emails. My tween loves getting mail. When I write her in our journal or in an email, I ask her about her friends and if the kid who bullied her still does, and what she thinks of her math teacher. Or I leave her little love notes on her pillow. My daughter and I both love books, but we obviously don’t read the same books. 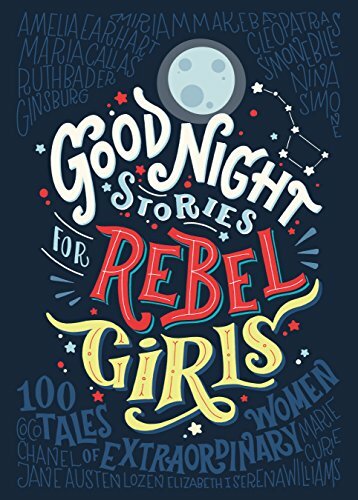 That all changed when we discovered Goodnight Stories for Rebel Girls. We keep this book by my bed, and every night she climbs in with me to discover more about incredibly strong women. Because even as kids get older, they still love being read to. So I read to her about women who inspire us both to be better women. And then she reads to me. And from these stories, we have discussed what an activist is, and where Ghana is, and what “self-sufficient” really means. 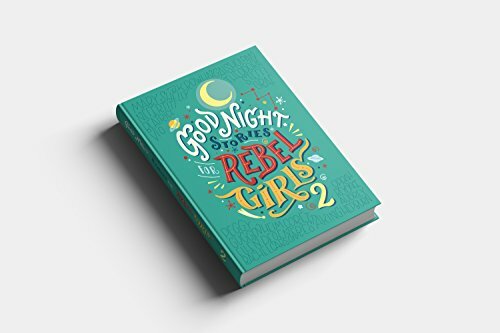 I can not wait to get us the Goodnight Stories for Rebel Girls Part 2 to continue our reading ritual. 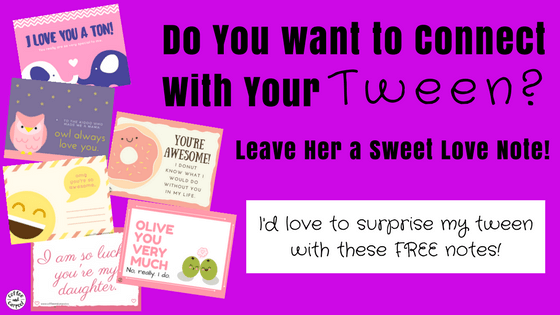 Need more ideas on how to empower your tween daughter? You’ll love this! I often sneak in “dates” with each of my kids. My youngest prefers pretzel dates and she earns them by being a good listener. But my oldest daughter, my tween, doesn’t need anything too specific. If I run to the grocery store and take her with, we call it a date. Addy and Mommy time. We hold hands through the parking lot and I squeeze our secret handshake into her hand. When we have extra time, we sneak in ice cream dates, hot cocoa dates, and movie dates to watch the movie version of the book she just read. We’ve done it with Harry Potter, Holes, and Wonder. 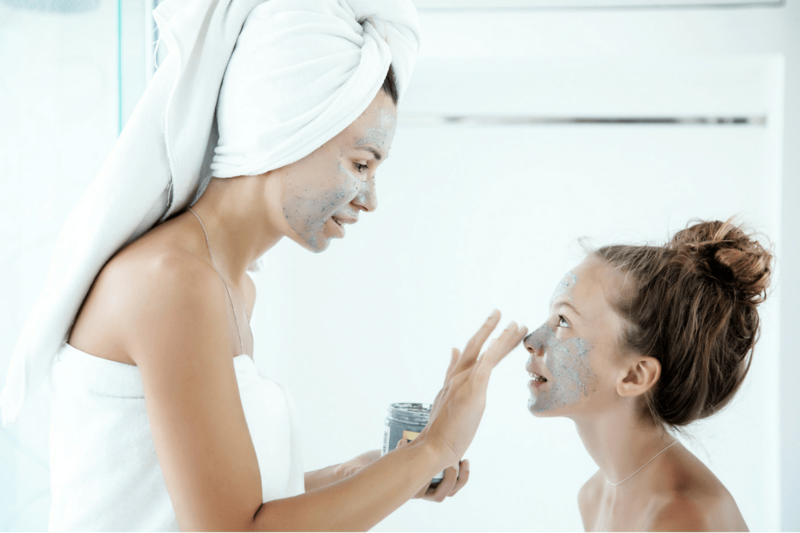 We do our nails or I put a face mask on both our faces or I show her how I put on my make-up. We’ve gone to hit a bucket of golf balls and we’ve gone on a Mother-Daughter hike and on a camping trip. We do things she likes to do, but I also stretch her into doing things I like to do as well. Did I mention we love to read? 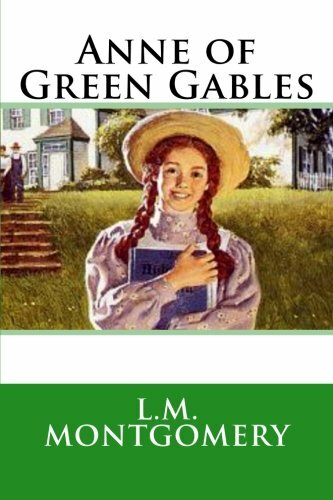 When I was a tween, I had a ton of favorite books I kept in an old cardboard box. Now I loan them to my daughter and re-read them at the same time she’s reading. 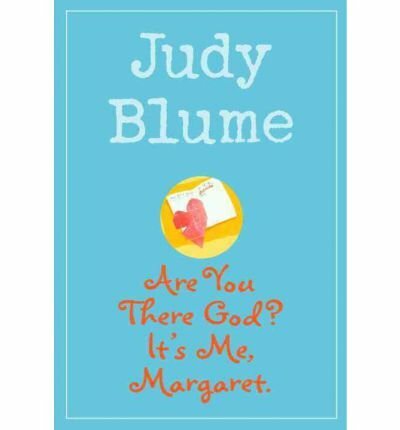 We then talk about the book when we’re driving to religious school or when we’re waiting for her sister or while I’m making dinner. 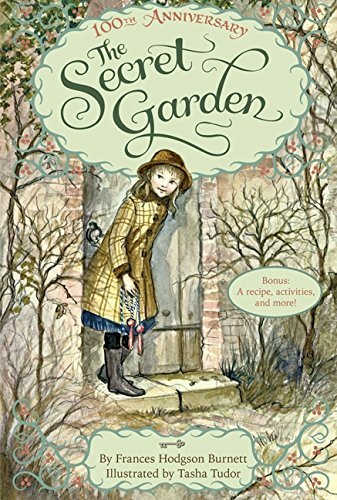 It doesn’t matter what books you share with your tween, as long as you make sure they are the ones you loved. 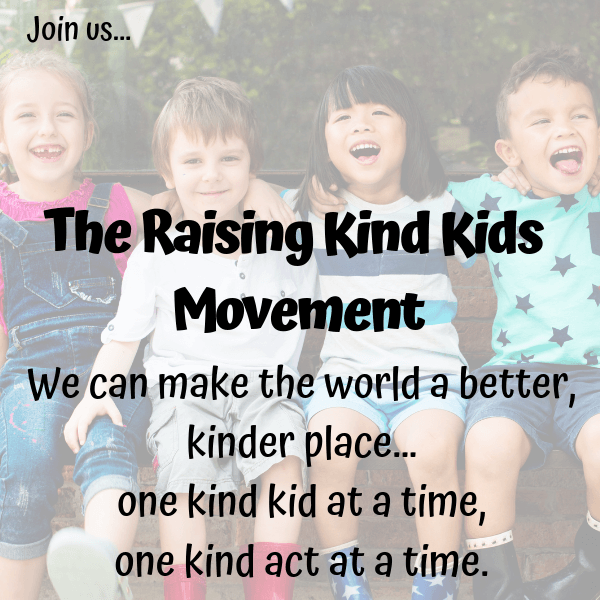 When our kids imagine us as kids and learn about what we loved when we were their age, it connects us on a deeper level. Or you can take turns and read a book they love so you read about genres or topics important to them. For better or worse, we are the voice inside their head. And kids don’t ever remember something we tell them once. Even if it’s the good stuff. We need to constantly and consistently remind them of how proud we are of them. We need to tell our tweens they are strong, and persistent, and beautiful. If they’re hearing negative talk outside our home or through the media, our voices need to be even louder. We need to make sure, on a daily and weekly basis, they hear words of encouragement that build up their confidence in healthy ways. 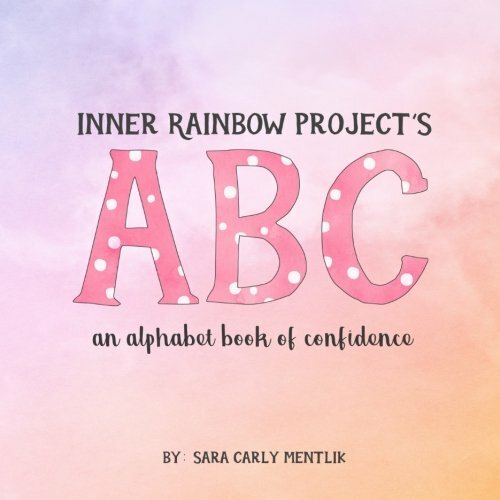 One simple way to make sure my daughter hears the words I know she needs to hear is to share the Inner Rainbow Project’s ABC Book of Confidence. When we read it together, she hears words like brave, confident, and adventurous. We talk about what these words mean and what she does that exhibits those traits. She will hear me repeat these words to her often because if I’m her inner voice, her inner voice is going to be a positive, encouraging one. My daughter doesn’t need me to tuck her into bed. She doesn’t need me to pull the covers up tight, or lay her stuffed animals in the correct order across her chest, or sing her songs anymore. But I still take the time to tuck her in. By the end of the day, I’m exhausted. I’m done with parenting and I crave me time. I need and want to get my stuff done. I want to work, or read, or binge watch my saved TV shows with my husband. I snuggle in with her and I roll on top of her for a second and she giggles about how heavy I am. Some nights I rub her back. Or I whisper sweet things into her ear. I ask about her friends, her school day, and the tough stuff. I talk to her about bullies and what makes a good friend and her hopes and desires. This is when I really learn about her. This is when she opens up and lets me in. And I cherish it. The dishes and the laundry and the TV shows can wait. 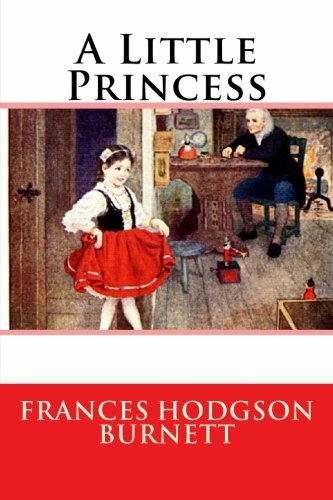 I want to know what she wants to be when she grows up and why she played by herself at recess again. I need her to know how much I love her and adore her. And it’s these connections that save my sanity when my tween is snarky and disrespectful and tests every rule and limit I set. Because in the middle of her next tween tantrum, I can close my eyes and picture us putting on our face masks and painting our nails and giggling over how heavy I am when I flop across her lanky body. I’ll cross my fingers that these moments we share will help us thrive during her tween years and build our relationship to be strong enough and ready enough to enjoy the rest of her tween years. 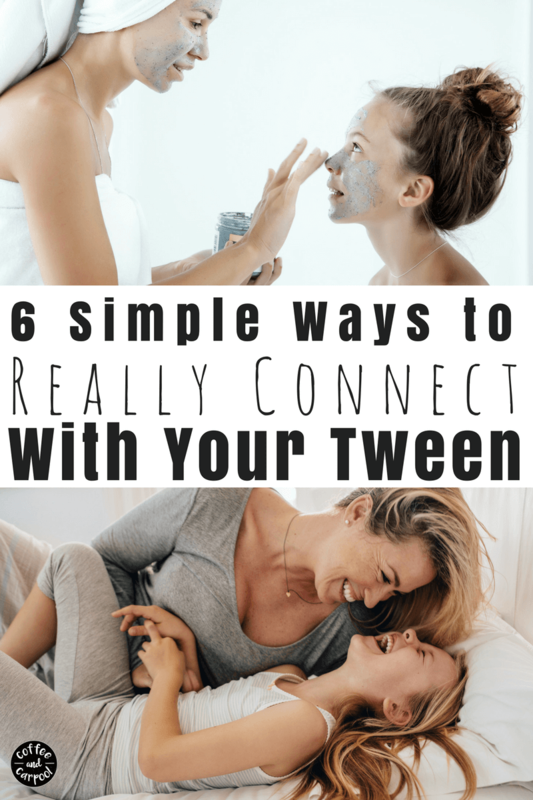 How do you connect with your tween? I’d love to hear your ideas! Here are more resources for Parenting Tweens! Great job! I am very impressed with your insights. Great tips…I will take any advice I can get in this area! It sounds like you’re doing such a great job as a Mom! Thank you for these wonderful tips.